The Winstanley School in Leicestershire has been assessed and has achieved the Inclusive School Award. The Winstanley School is a Leicestershire school situated near Leicester in Braunston town. Although a county school it has a 70% intake from the city. Pupil Premium makes up 38% of the population while 24% of students are on the SEN register. In essence, this is a new school having experienced a number of significant changes in recent years. The Winstanley School is a vibrant and stimulating learning environment that reflects inclusive practices in the implementation of policy and working protocols. This is embodied by the core values of Supporting others, Hard work, Independence, Never giving up, and Excellence. It is expressed with the statement of SHINE “brighter than you thought you could be” SHINE is a lot more than an acronym but a set of principles and values that underpin and articulate the core ethos of the school. The school prospectus states that this ethos is “pivotal in creating the climate in which all can succeed.” A small school by comparison, population of 600, this allows for an atmosphere of nurture and support to exist beside expectation and challenge. The MAT is a significant development for the school and has led not only to a change in the leadership structure and personnel, but the development of a new culture based on a clear strategic vision for the school. Inclusion is at the core of this new culture. The close relationship through the MAT with Bosworth Academy has supported the implementation of the strategic plan on several levels. There has been significant skill sharing between the two schools. This has included departmental partnerships, joint meetings, joined moderation of work, sharing of resources, joint projects with students etc. Some staff from Bosworth have taken up positions to support the development of the Winstanley vision. During my visit I observed numerous interactions that demonstrated this, staff greeting students at the front gate as they arrived, reception and office staff offering support to students on day to day practical matters, staff subtly reminding students where they should be and what they should be doing, offering care and attention to upset students and challenging where necessary. The new culture and vision is supported by a strategic plan. This is a staff group who have ownership of the new culture and vision, believe in it and understand how it can support students to reach their potential. Quadrants have several spokes that support outcomes and the School Leadership Team structure and responsibilities ensures all have ownership and it is not a top down exercise. This goes beyond the SLT of 2 Co-Heads, 1 Deputy Head and 3 Assistant Heads. It also includes Heads of Department, Heads of Year, teaching staff, support staff, Lead Practitioners, the business manager and the students. A good example of this can be seen in how the spoke, led by one of the Assistant Heads, concerned with developing a consistent system to support learner progress as part of the Academic outcomes quadrant, was implemented. A key aspect of this included using data to raise standards and improve student outcomes. A new tracking system incorporated the 9-1 grading system and each year group is tracked 3 times a year, with year 11 an additional track to help identify those needing extra support. Tracking and data analysis is a standing item on the SLT agenda. The system will also contribute to CPD where it may identify staff that may need formal training, or it could be briefings to a group of staff. During the assessment I observed a staff briefing before students arrived in the morning on developing strategies for students with EAL. 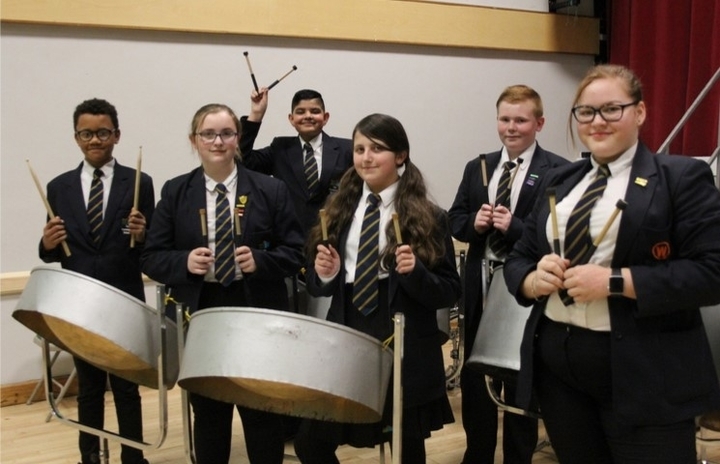 Whilst the tracking and raising aspirations systems contribute to the performance management, there is a strong culture of support being developed within this school. This is shown in the Personal Improvement Plan for staff that includes targets and objectives for the individual related to the strategic plan but also includes a coaching model of support to ensure staff have an opportunity to contribute to their development. The data is also used to track and provide information not only on a departmental level but year group, class and individual level and supports subject specific target setting for students by staff. Staff feel students’ understanding of what they need to do is better and expectations are clearer. This helps build self-belief and enthusiasm. Following a review of the data a focus for the Learning and Teaching quadrant was established with an emphasis on pace and challenge led by one of the Assistant Heads. This was delivered through morning briefings, staff meetings and training sessions. The key theme of developing good practice through research and sharing that practice across the MAT was aimed at creating capacity for middle leaders to lead on Learning and Teaching rather than manage it. This initiative is currently being delivered but is another good example of developing a new culture that raises aspirations and standards. To further emphasise the strategic planning in developing the new culture based on the SHINE values, the raising standards/aspirations spoke is connected to the focus on behaviour led by another Assistant Head. This supports the standards agenda by having a clear focus on pastoral support based on a clear and consistent behaviour policy. While some systems are emerging and establishing themselves, the students are very clear about school expectations and the behaviour policy. To begin with, the new behaviour policy introduced in 2016 focused on establishing basic expectations and providing clarity on routines. The current plan covers areas such as rewards and recognition, interventions, performance of vulnerable groups, re-structuring of pastoral support and improving attendance. A key development in Pastoral support has been the development of the Head of Year Team. They are non-teaching and can concentrate on the pastoral role for their year group. Although a new initiative, they are an important part of the strategic plan to support all students in SHINE, they help embed the behaviour quadrant. Heads of Year provide a range of services to students that include both formal and informal support to groups and individuals. They also support the preventative interventions that take place in the progress hub and can pick up on concerns that are identified through the tracking process. The embodiment of a new culture is evident in the recent refurbishment. This has included brightening the décor and replacing new windows and roofs. Whilst a new logo and building improvements including wall displays are welcome, it is part of the plan to establish a new learning environment that supports the new vision. The use of IT and technology is a further example of how the environment supports the vision. This is evident in classrooms, the IT suite and the creative use of Google classroom to support learning on an individual level. Transition into year 7 is a strength of the school. There is a well-established programme that begins with a taster day for year 5 students in primary schools and culminates with intake day the July before they go into year 7. In between, there are open days and visits by staff to primary schools to meet teachers and students. The partnership arrangements with schools are enhanced as the Head of Year 7 has oversight of the transition programme. The SENDCo and the Additional Needs Manager are also involved and there is open access for parents to these members of staff. The SENDCo attends transition reviews for those students who have an EHCP and will liaise not only with the school but also parents and an early induction day is arranged. The success of the transition programme and the importance attached to it is evident by the quality of information given to staff about all new students. The new students following induction day are given an induction booklet to complete over the summer and an ‘All about Me’ booklet when they start. There is also a day trip organised for all year 7 students.